Away days to inspire strategic thinking in your team could not be more attractive than on Lynher. 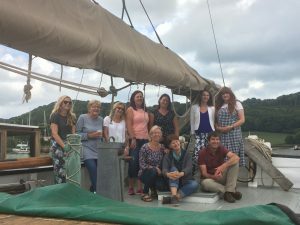 Put your thinking caps on and dream up new plans and strategies whilst the barge glides along the River Tamar, carrying you and your team to a secluded cove for a lunch at anchor. 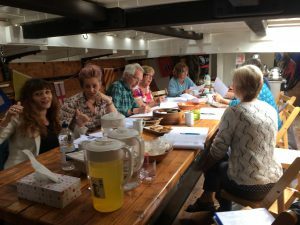 Help hoisting and lowering the sail, drop the anchor and generally work together as a crew, jellying with your colleagues whilst having a laugh. Your mind will be so refreshed by this experience that it will create a wagonload of new ideas to help your organisation grow and develop. “The Lynher was the perfect venue for us to do some creative thinking and enjoy each other’s company too, the food was simply delicious and you were lovely, welcoming hosts too – thank you! !” Sara Marsh, The Hall, Treverbyn, Cornwall. 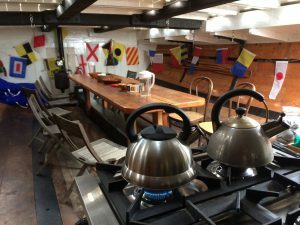 You can also book the barge for..birthday parties, small conference venue, film settings, river festivals and much more….a floating space for all of your “out of the box” venues. Please contact the office for details and personal requirements. To book (or find out more information) give us a call on 01752 710052, email info@tamarbarge.org.uk or use the contact form below to send us a message.